Gushalevych Ivan Nikolaevich (4 Dec 1823 – 2 Jun 1903) – Ukrainian writer and public figure. Born in the village (now – Chortkiv district, Ternopil region) in peasant family. He studied in the Buchach school and Lviv seminary. Worked as a teacher, particularly in Lviv academic gymnasium (1862 – 1889). In October 1848 he participated in the "Council of Ukrainian scientists", edited a newspaper that published in Lviv. 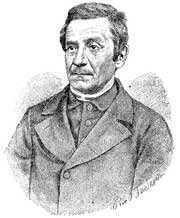 In 1861 elected to the Galician Sejm (Regional Council), in 1866 – deputy of the Austrian parliament. He died in Lviv, buried in Lychakiv cemetery. Began his literary career in 1848 (Verses by Ivan Gushalevych. – Przemysl, 1848). These works were written in the people's language, albeit imperfect. Gushalevych later began using Russian slang and was great fan of it. In Russian slang published collections "Poems" (1861, part 1; 1879, part 2), "Galician echoes" (1880), "Verses" (1884), "Balkan thoughts" (1891). Besides poetry he wrote the plays "Pidhoryany" (1865), "Deception Eyes," "Women proposal" and "Rural representatives" (1870). In 1887 published his memoirs of revolutionary events of 1848 in Lviv. After 1887 away from creativity. Ivan Franko Ivan Gushalevych. – Literary and Scientific Bulletin, 1903, Number 8, p. 111 – 128; Number 9, pp. 163 – 187; Number 11, p. 92 – 120; Collected works in 50 volumes, K., 1982, vol. 35, p. 7 – 73. M. Zh., Jan 20, 2016.